A Solar Charge Controller (or solar Regulator) is a device which protects batteries in a solar electric system from being overcharged or being over-discharged. Overcharged batteries have a much shorter life time than well cared for batteries since the electolyte is boiled off as gas and lost. Overly discharged (i.e. flat) lead-acid or gel batteries become permanently damaged, so a solar charge controller is used to disconnect any load when the battery is discharged down to a safe cut off voltage. 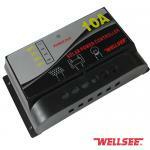 So do You Need a Solar Charge Controller? A charge controller is not always required if the maximum current going into the battery is not more than 10% of the batteries Ah capacity (C/10) - i.e. if the battery is 60Ah then a charge controller is certainly required if the current from the solar panel is likely to exceed 6 Amps - as long as you make sure you don't over-discharge the battery. Good quality solar charge controllers are up to 30% more efficient than basic 'on-off' regulators as they have provide pulse width modulated (PWM) battery charging. When the voltage of the battery bank reaches the regulation voltage (14.1V), instead of stopping charging altogether, the patented PWM algorithm reduces the charging current and continues charging slow enough to prevent the battery overheating or gassing. PWM helps to get the batteries charged up to well over 90% capacity, extends the life of the battery, and means that more of the power generated by the solar panels is stored. Since the batteries store more energy on average, a smaller battery (or less batteries in a battery bank) can be used reducing overall system costs. Buying a Solar Charge Controller in the Ukm the prices ranges from around £15 to many hundreds of pounds depending on the size of the solar power system to be regulated and the quality and features of the controller. With solar charge controllers you really get what you pay for. It is well worth spending a few pounds extra to buy a good quality PWM controller from the start since it will pay for itself by getting more energy into your batteries and by protecting the batteries properly. 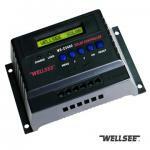 We wellsee manufacture a range of high quality pulse width modulated solar charge controllers including the 6A-80A solar controller, all are approved by CE, ROHS, IEC and sold with a 3 year warranty. We have researched and produced new 80A type, mainly for 12V,24V,48V voltage, welcome to order! Welcome to be our agents!